Recently, we reported on how different some celebrities look without makeup. (We admit, we look a little different in the morning before we make over our face as well.) And for some iconic beauties, something as small as swapping out a red lipstick can completely transform their look. 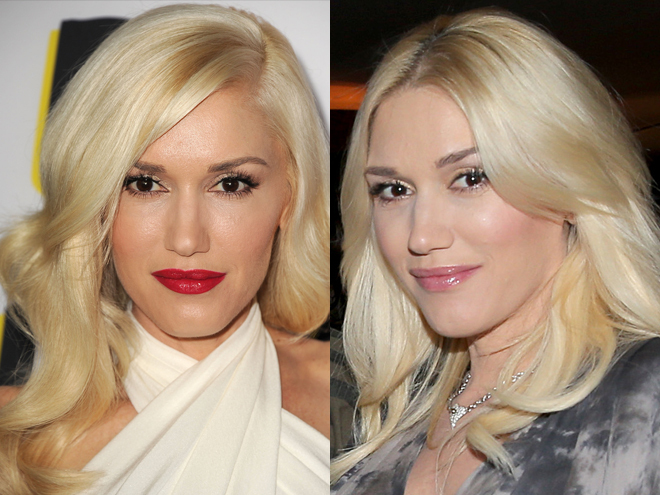 Just take a peek at Gwen Stefani, who is rarely seen without her signature bold lip. Although the singer only swapped out her red lip for a soft pink gloss, and kept the rest of her makeup completely the same — light foundation, subtle blush and bold lashes — she looks completely different. Look at how the red lipstick contrasts with her fair skin, brightening her complexion. The bold color defines the lips and adds definition to the entire face while the gloss blends into the entire look. We love a simple glossy lip, but in our minds nothing compares to a classic red. What do you think of Gwen’s look?